The last week in September is the busiest time of the year for UK labour wards, as more babies are conceived in the weeks leading up to and days after Christmas than at any other time of the year. 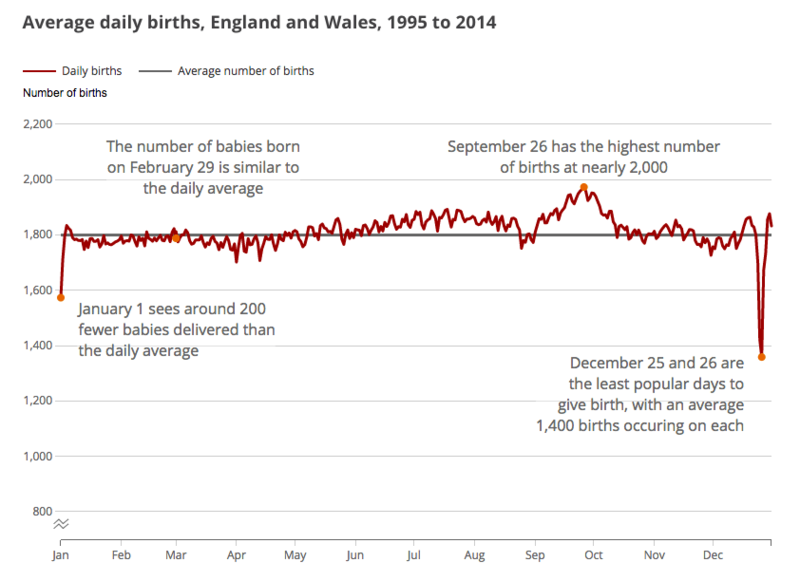 The interactive graphic below shows the average number of births on any given day and shows how popular the day is for giving birth by way of a rank from 1 to 366. The data is based on twenty years’ worth of data, compiled by the Office of National Statistics. Technically, February 29th has seen the lowest number of births over the 20 year period. However, the data has been adjusted for the number of times the day occurs over the period, placing the day just slightly below average. September 26th was the most popular day to be born over the last two decades, which falls 39 weeks and two days after Christmas day. 8 of the top 10 dates of birth were towards the end of September – with the other 2 being early October. Part of the reason for this increase in births could be due to couples planning to have children at the start of the school year. If births were evenly distributed throughout the year we would expect on average 1,800 births each day. But the average number of births on September 26 was around 2,000. England and Wales is not the only country to have seen this trend. Similar analysis using data for New Zealand and the U.S shows a larger number of babies born in September. While the Christmas holidays may be a popular time to make a baby there tend to be fewer babies born, with 6 of the 10 least popular dates of birth falling in the Christmas and New Year period. This is likely to be due to the large number of bank holidays over the period. Hospitals will generally only be delivering natural births and carrying out emergency caesareans over the holidays. Induced births and elective caesareans are likely to be scheduled on alternative dates. February 29th has the lowest total number of births over the twenty year period because it only occurs once every 4 years. However, the average number of births on February 29th takes into account the day only occurs on a leap year, resulting in a value just under the overall daily average. Interestingly, April 1st is ranked low, perhaps due to parents electing not to have an April Fool’s Day baby where possible.